Today’s page of Team Stryker is one of my favorite pages of the entire issue (so much so that the TS line up is the banner on the TS Facebook page). When writing this page I realized that I was 11 pages into the issue but still hadn’t given Boris Drunkov’s back story. 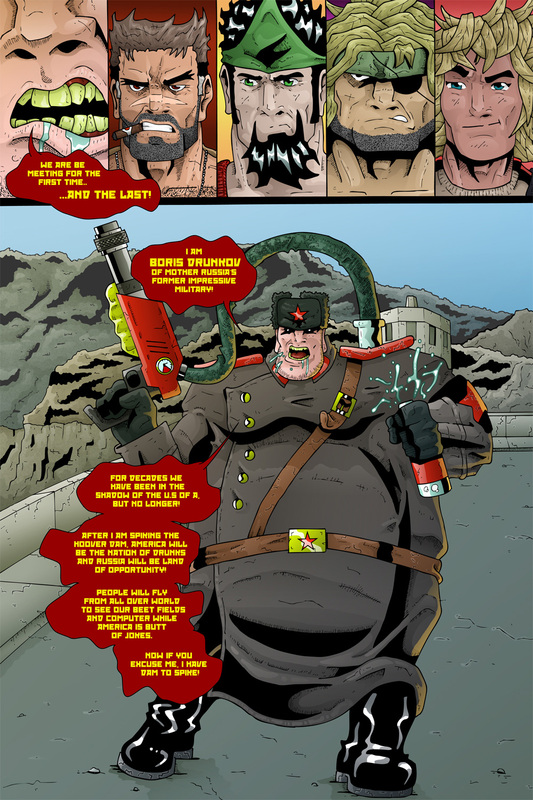 With each issue I try to make each villain as fleshed out as the main characters, which was extremely fun for Drunkov. I also got to show off Drunkov’s full design which is fun to design as I got to look at a lot of old Russian military outfits and pick and choose the best elements. His vodka cannon as based off several Nerf guns which I then went and heavily modified. Have a great start to the week and come back on Wednesday to see the newest update!